When a 41-year-old father of ten was not feeling well, he went to his local hospital, but was released because the doctors found nothing wrong. On his way home, however, he had a massive stroke. 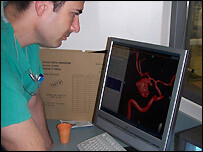 Near death, he was rushed to the Hadassah Medical Center, where he was treated successfully by renowned Neurosurgeon Prof. Jose Cohen, head of Hadassah’s Endovascular Neurosurgery Unit. The appreciative father is expected to make a full recovery!